Get the best of bass- and guitar-amp tone in one rack-mountable head. For years bassists have been combining guitar and bass amps to remarkable effect, adding harmonics and layers of overdrive from guitar amps to their core bass tone in pursuit of the ultimate live sound. This "bi-amp" trend got the Orange engineers thinking, "Why drag two amps to the show when you could take just one?" 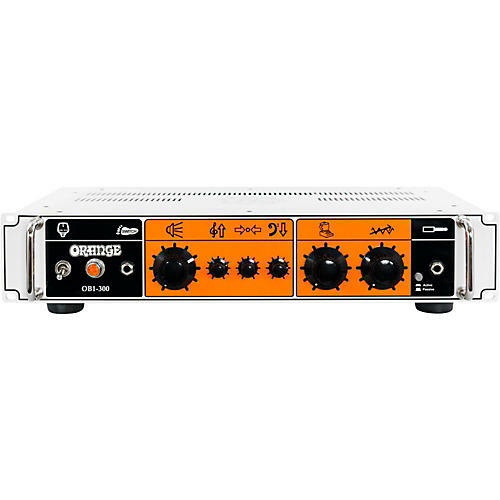 The result is the Orange OB1 300W rack-mountable bass head, which takes care of this and much more. There is also a 500W version, for those who need a little more punch. The key to the OB1' unique sound is Orange's footswitchable Blend circuit, which adds a veneer of controllable gain and increased harmonic content to the upper registers of the input signal. The lower frequencies and clean signal are left alone, staying warm and clear just as they would be in a "bi-amped" setup. Depending on where the Gain and Blend controls are set, the possibilities are limitless. Punch in the Blend control to achieve anything from a transparent clean boost, to all-out filthy grind, and everywhere in between. The OB1 splits the input instrument signal into two separate paths. One side amplifies the clean signal, with all the clarity you would expect from Orange. The other adds up to two stages of distortion to the upper harmonics only, controllable via the amp' Gain knob. These two elements are combined using the amplifier' Blend control, which adjusts the mix between clean and dirty. The Blend control can then be remotely engaged or defeated using the optional footswitch. The Gain and Blend' range allows for almost anything, from a subtle level boost to cut through the mix, added girth and presence at moderate settings to fatten up chorus passages, to fully saturated savagery at the extremes. However you dial it, the OB1 always maintains the critical low end definition, right the way up to the most offensive settings! The OB1' highly responsive active three-band EQ has been meticulously voiced for maximum effect with minimal fuss. The EQ section is located after the Gain and Blend dials take effect, allowing full control over their massive sonic range. The Bass and Middle controls feature +/-15dB of boost or cut, whilst there is a range of +/- 20dB on the Treble control. Dimensions: 18.97" x 10.43" x 3.93"
Get the best of both worlds. Order today!